Speednet Communications Pty Ltd is now Endorsed by the Federal Government which means our services have been tested for performance, reliability up time and consistency. Government bodies such as health and aging, broadband for the bush are enjoying fast reliable fully managed services all over Australia and Tasmania, where available. 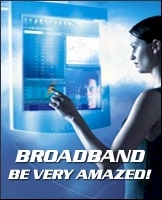 Speednet offer a variety of broadband plans to suit all needs. Entry level Speeds from 256/64 to 8192/384k with generous data allowances coupled with 24/7 direct technical support makes Speednet the last Internet provider you will ever need. For business customers the unlimited plans are fixed-price, with no hidden charges for excess data, so there are no extras at billing time. Our plans also include additional mail boxes, SPAM and virus filtering and static IP addressing, as standard coupled with legendary reliability and performance. For our residential customers our limited plans provide for individual needs and simplicity. Rates are capped no surprises at billing time. All Plans are Minimum 12 months contract, and incur a setup fee of $165.00. Rapid Churn connection of $66.00 is available. Call for details. All accounts come standard with a Static IP number and limitted mail boxes unlimitted capacity.